Moynihan Station today, 10:45 a.m. – Dramatic stage lighting in New York colors illuminates bare steel trusses, a backdrop to the podium where the governor will talk up the new train hall, any minute now. Tables in the far back of the room, behind a crowd of hundreds of construction workers and sweaty guys in suits, are loaded with Penn-Farley coasters and free cider donuts. It's humid, dark, and a little dusty, but despite the large gathering, there was just a little news at the former post office today: The project's about to start full-on construction. Governor Andrew Cuomo was in the city to announce a construction milestone at the Penn-Farley complex, the soon-to-be bigger and (hopefully) better train station on Manhattan's West Side. This was the last time the James A. Farley Post Office, re-christened as the Moynihan Train Hall, will be open to the public before it's transformed into a transit hub by SOM. Contractors had just knocked out the McKim Meade and White–designed hall's second-floor mezzanine, a move that allows the major interior build-out to begin. In June, the Empire State Development Corporation (ESD) inked a $1.6 billion deal with a developer-builder team to transform the structure into a retail-office complex and train station. The three companies—Related Companies, Skanska, and Vornado Realty Trust—will contribute the largest share ($630 million) towards the project, with New York State kicking in $550 million. Money from Amtrak, the MTA, the Port Authority of New York & New Jersey, and federal grants round out the project costs. The 255,000-square-foot station will serve Long Island Rail Road and Amtrak riders. Like the World Trade Center Oculus, or its slightly older cousin at Fulton Center, Moynihan's skylit concourse will be ringed by retail, more than 700,000 square feet of it. To make transfers easier, the just-completed West End Concourse will connect Moynihan to Penn Station, just across 8th Avenue. Construction began in September and the train hall is expected to be complete in 2021. 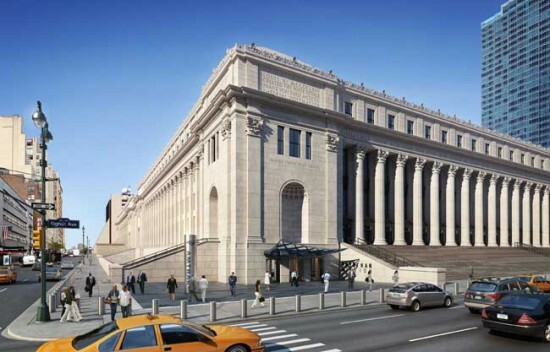 After years of delays and dashed hopes of development, the plan to extend Penn Station into the Farley Post Office across the street might finally—possibly—be on track. 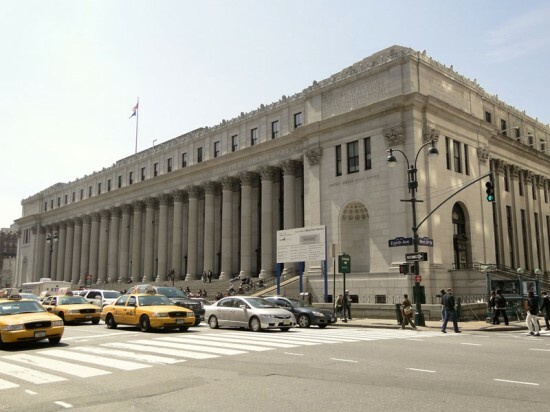 According to The Wall Street Journal, “Empire State Development Corp., the state economic-development agency, is looking for a broker to sell 1.5 million square feet of unused real-estate-development rights attached to the property.” The hundreds of millions that this could generate would go towards transforming the Post Office into Moynihan Station. The new space would include a grand waiting area for Amtrak inside the building's main hall. While no concrete plan or timeline is in place, the state’s request could provide significant funds to kick-start construction. Key word: Could. Construction on the two-track Gateway project, a new tunnel between New Jersey and Manhattan, will commence this summer beneath Related Company’s Hudson Yards redevelopment site. 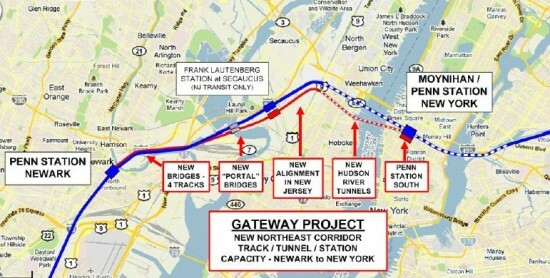 Related Companies and Amtrak will build this 800-foot-long “box tunnel,” which will first serve as a shell for Amtrak’s rail connection linking the Hudson tunnel to Penn Station’s tracks, and, eventually, to the proposed Moynihan Station. The actual Amtrak Gateway Project is still years away, but construction on this first leg of the tunnel is happening now to coordinate with construction on Manhattan's West Side. The project will be funded by the federal government including some funding from the Hurricane Sandy relief package meant to help mitigate flooding during future storms. It's estimated to cost between $120 and $150 million. 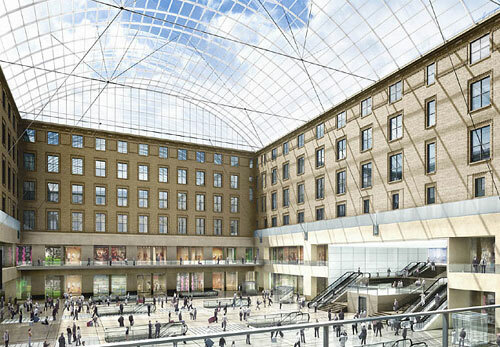 The plan to relocate Pennsylvania Station to the James Farley Post Office across the street has been slow in coming. The developers, Related Companies and Vornado Realty Trust, are now revisiting a previously-rejected proposal to move the Borough of Manhattan Community College (BMCC) to what will be Penn Station’s new home, called Moynihan Station—named after Senator Daniel Patrick Moynihan who first introduced the idea in the 1990s. The New York Times reported that the college would theoretically occupy 1.1 million square feet of the building, and in return, the developer would take over BMCC’s campus downtown. But, it looks like government officials still have their reservations. Some progress has been made, however. The state has provided around $300 million for the construction of a new passageway and two new entrances leading to Penn’s train platforms. Skidmore, Owings and Merrill designed the plans for the renovation of the station. Moynihan Station might not be welcoming its first passengers for years to come, but a heavy-hitting group of officials gathered at the James A. Farley Post Office to sledge-hammer a cinder block wall and declare Phase I ground officially broken. When complete, Moynihan Station will offer relief to the adjacent Penn Station (whose predecessor was regrettably demolished in the mid-1960s) and its 550,000 daily commuters. The brainchild of late Senator Daniel Patrick Moynihan, the project has been planned for almost two decades. Among the political celebrities gathered on the 100th anniversary of the original Penn Station were Mayor Bloomberg, Governor David Patterson, Senator Charles Schumer, and Secretary of Transportation Ray Lahood who brought tidings to the tune of $83 million in Recovery Act TIGER funding. The first phase is estimated to cost $267 million, jointly funded by State and Federal governments. 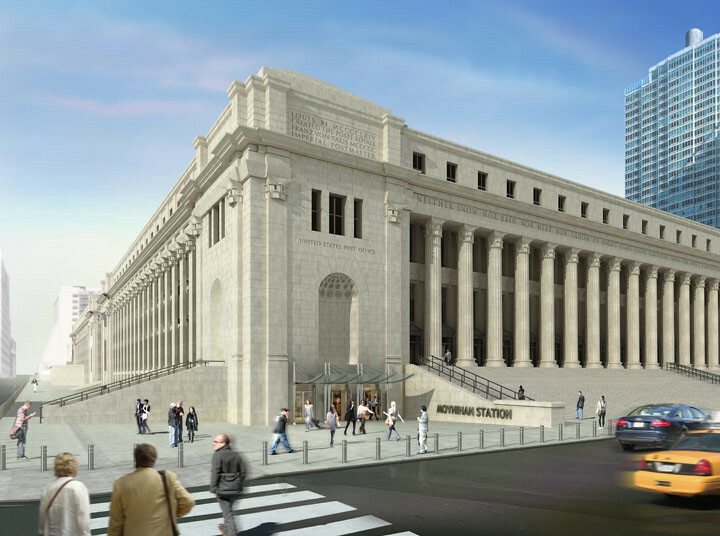 Phase I construction will puncture two new entrances into the Farley Post Office to expand Penn Station and provide a larger West Concourse to accommodate Amtrak trains. It's slated to take about six years to complete the project as work is relegated to nights and weekends, a time span the NY Daily News points out is only two years shorter than the construction time for the original Penn Station and 5-miles of tunnels. Planning is currently underway for Phase II which includes a grand hall in the center of the Farley building. On Wednesday, right on deadline, the U.S. Department of Transportation announced the winners of its Transportation Investment Generating Economic Recovery (TIGER) Grant winners. Out of 1,400 applications totaling $60 billion in requests, the agency awarded $1.5 billion in American Recovery and Reinvestment Act money to 51 transportation projects in 41 states. The projects ranged in scale from bike paths to major bridges and freight rail installations and the grants ranged in size from $3 million to $105 million. Priority was given to projects that needed federal funds in order to complete their funding package and to projects that are expected to be completed within three years. 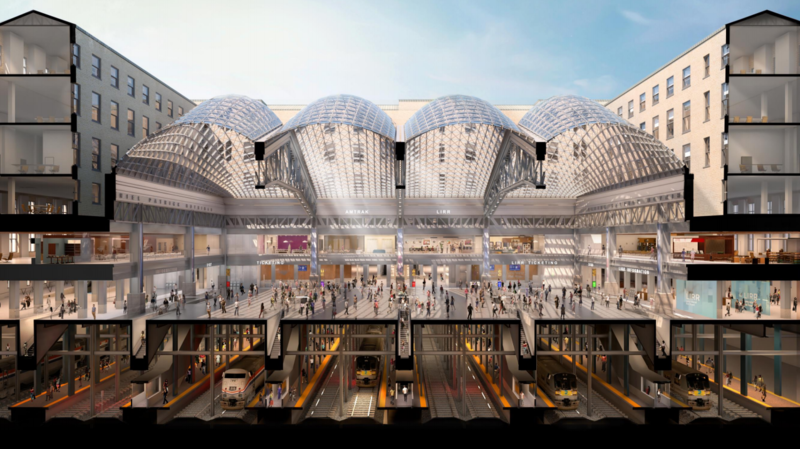 In New York, the DOT awarded $83 million to the first phase of Moynihan Station. This bit of good news for the project, which has been mired for years in funding difficulties, was bolstered yesterday when Amtrak reaffirmed its intentions to move its operations into the proposed station.